(This article first appeared in the Huffington Post). As I listened to the ads from the ill-fated campaign to label genetically modified food in Washington, I felt a sickening case of déjà vu. About a year ago, I wrote a controversial article for the Huffington Post, titled “Ten Grassroots Lessons From Monsanto’s Swift Boating of the Prop 37/Label GMO Campaign.” To my disappointment, Washington’s campaign was making the very same communications error that doomed our effort in California in 2012. And it ended the same way: an initial poll showing 90% of the public supporting labeling was reduced nearly in half, to below 49%, and the ballot measure failed. What I suggested then–and repeat now–is that the decision, by the label GMO campaign managers, to ban all references to food safety and public health, was a lethal error. When up against the better funded, eager-to-deceive Monsanto propaganda machine, it was like entering a gunfight against an assault-rifle equipped enemy while armed with love beads and peace signs. A New York Times poll released in July showed that some 93% of Americans want labels on genetically modified food, “with most of them worried about the effects on people’s health.” This makes a lot of sense, considering that about 90% of all corn in the United States is grown from seeds genetically altered to contain a pesticide, one that has been proven to remain in our bloodstream long after it is eaten. When I spoke to some of the key organizers behind California’s Right to Know Campaign, they said that their initial “polling showed” that voters do not respond well to “negative” ads. And that talking about health concerns like widely shared consumer worries that genetically modified food might increase the likelihood of cancer, allergies and other illnesses, was negative. Which was why they refused to allow onto the video section of the Yes on Prop 37 website a single one of the hundreds of ‘person on the street’ videos that our volunteer KnowGMO.org effort had collected in California. 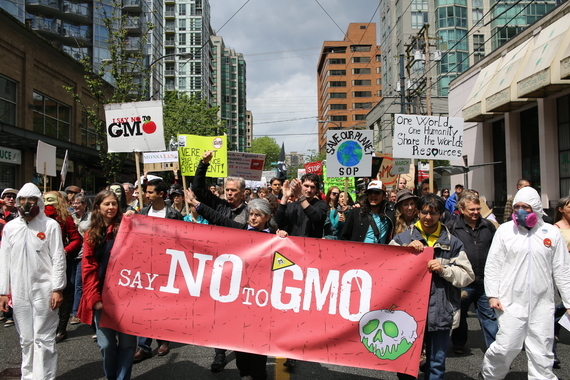 Most consumers told us that they wanted to label and avoid GM food because of health concerns. The self-defeating mythology among professional activists against “going negative” is made worse by a refusal, on the part of many activists, to criticize “people who worked so hard” (and spent so much donated money) on the campaigns. The desire to provide a positive spin on the results of the two failed initiatives to label GMO’s ignores the need to learn from the mistake of avoiding consumer health concerns, presumably because organizers want to encourage activists to “stick with it” next time. Next time is already underway in both Colorado and Oregon, where groups are working to get labeling measures on state ballots. It is not reassuring to note that they are calling their efforts Oregon Right to Know, and Right to Know Colorado. It’s time to shift tactics and follow the “lead with the negative” example that Monsanto’s much better paid experts have set. Perhaps for the next election season, campaign organizers will wake up to reality. If they could re-orient the campaigns to create “Right to Safe Food”-focused initiatives, fewer voters would be swayed by Monsanto-funded deceptive ads. Like millions of parents and activists who oppose genetically modified food, I feel that the stakes are very high in this battle the safety of our world’s food supply. If we are to win it, we are going to have to fight tougher. And smarter.